montana, I've given you your own thread, so the answers to the original poster's questions and the answers to yours don't get mixed up. Please do not send in another app unless you call and the classification officer tells you they don't have it. I know first hand they must process each request or item of mail and duplicates take up loads of unnecessary time. Call and ask the status on your visit app. Metro cannot be added to the phone list. You will need a contracted cell phone or land line. If you go to Florida What You Need To Know, you will find everything you never wanted to know about DOC in Florida. Hi I have Metro pcs no contract and have no problems getting calls. Have you looked to see what phone service that facility uses for phone service? I know where my son is the phone service is GTL (app Connect Network). 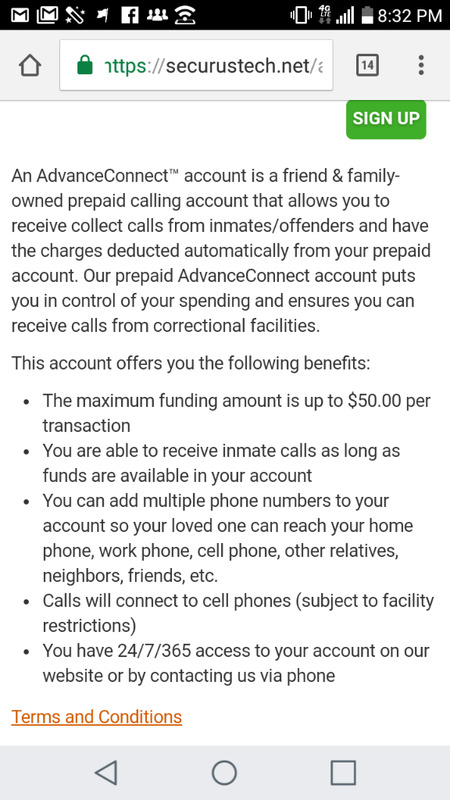 I selected his facility I add money on my account he calls I agree to pay for the call and it connects. I can't believe with all the phone companies going to non contracts their care about whether your cell phone is on a contract. No ma'am, FDOC does not allow non contract phones. Here's what I found for FDOC. I'm adding the pics of what their site states. It appears to be no different from Connect Network. It doesn't say your cell phone has to be on a contract. You could try it and see if it works since you get to pick the facility and maybe inmate ( I didn't have to do the inmate for the Kansas Federal System). Hope this gives you a starting point. Securus is the contracted provider for most of the Florida inmate phone system and they have their own system. BUT, FDOC has their own policy and rules we must follow as well. I am first to say, try it they can't eat you. Then, you can go to the 33's and read the prison systems rules and policy for the phone number being denied. Please, please do not give direction if you do not have RECENT, first hand knowledge of this state's 33's. I have lived, ate and dreamed them for 28 years now and with the constant changes, I have to double check, myself.